Walkers are being urged to sign up to a 11-mile sponsored pub walk and help raise money for local good causes. 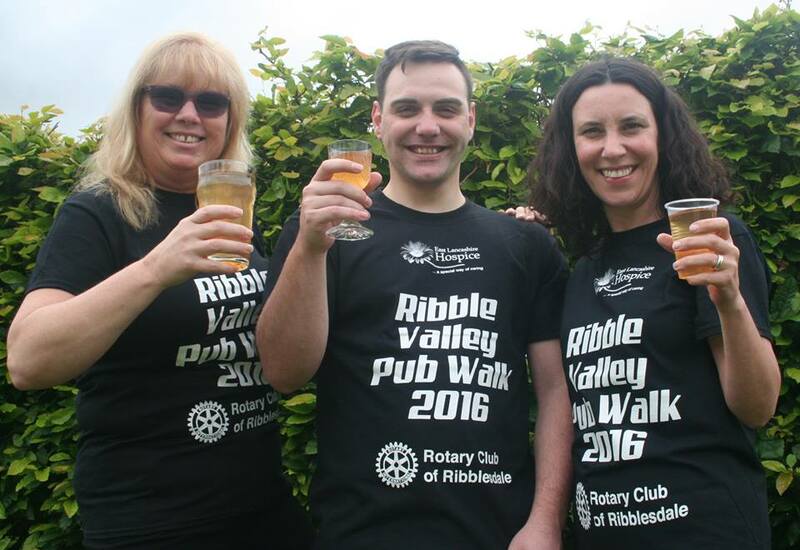 The Ribble Valley Pub Walk, on Saturday 24 June, is organised by the Rotary Club of Ribblesdale in aid of East Lancashire Hospice. Last year saw around 250 people of all ages taking part and the event has raised almost £30,000 since it started in 2015. The walk takes in some of the most scenic parts of the picturesque Ribble Valley and stops at many pubs along the way including The Aspinall Arms, The Three Fishes, Brady’s Wine Bar, The Dog Inn, The Swan and the De Lacey Arms. Barry Wood, from the Rotary Club of Ribblesdale, said: “The route is similar to last year, with a slight amendment so it takes in the beautiful Edisford Bridge and Bashall Barn. The route is planned and marshalled by the Rotary Club and half of the registration money goes to the hospice, and half to the Rotary Club charities. All sponsor money raised by those taking part goes directly to East Lancashire Hospice. Sharon Crymble, Fundraising Manager at the hospice, said: “The Ribble Valley Pub Walk is always a fantastic day with a great atmosphere. Entry to the event costs £10 and every participant will receive a t-shirt. Registration starts from 10am at Whalley Village Hall, with the walk beginning at 11am. Alternatively, visit www.­eas­tla­nc­shos­pi­ce.­org.­uk and register online.